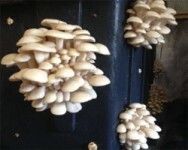 CCE's Urban Agriculture Program is collaborating with the Cornell Small Farms Program and Farm School NYC to offer "Indoor Specialty Mushroom Cultivation." The six-week course combines mushroom growing and marketing instruction with discussions about the ethnography of mushroom production. Harvest NY Urban Agriculture Specialist Yolanda Gonzalez will co-facilitate the course. Students will gather from 6pm - 9pm on Tuesday evenings to participate in Cornell's 90-minute mushroom cultivation webinar together and then explore how indigenous and other cultural history and practice, race, class, and social justice relate to the themes raised in the webinar. Cost: Sliding scale based on income plus $20 for mushroom cultivation kit. Click here for more information and to register.